Bacchetta began in 2002 with three SWB bikes. They’ve grown and now offer six models in different configurations and sizes to fit most riders. 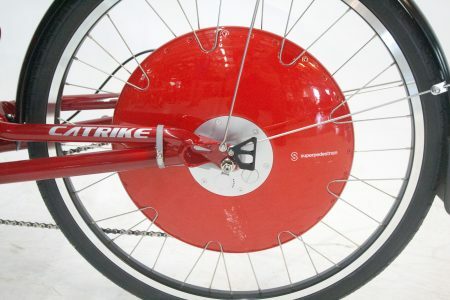 Made from Chromoly steel, aluminum or carbon fiber they range in weight from ~21 to ~34 lb. Bacchetta’s signature SWB OSS bikes lean toward performance and are still the company’s bread and butter. They share relatively high bottom-brackets, relatively reclined seats and approximately 47-48″ wheelbases. They also have the Bacchetta “Tweener Bars”, so called because your knees are between them. These bend down 90 degrees to give a vertical grip area. I like the Tweeners adjusted about 60 degrees from horizontal, comfy & relaxing. Bacchetta has also ventured into the recreational and touring markets with the Bella. This new bike is a low bottom bracket long wheelbase machine with above seat steering, similar to the RANS Stratus LE. Novices often find them more comfortable and easier to ride than some of the company’s more performance oriented designs. 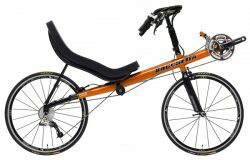 Bacchetta’s racing efforts have far surpassed those of other recumbent manufacturers in recent years. In addition to countless wins in regional races, Bacchetta has racked up wins in the prestigious RAAM – Race Across AMerica. Company principle, John Schlitter also became the first person to complete RAAM in the solo recumbent category in 2008. After a few growing pains, Bacchetta’s quality has become top notch and at least on par with the best in the industry. 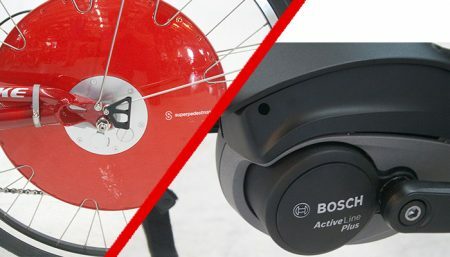 Most of the components are made by SRAM which we’ve found to work great but some of the lower end parts aren’t as durable as the Shimano equivalents. The rear cable guide is positioned quite close to the brake making cable housing length critical. Carefully cutting the rear brake cable to length pretty much eliminates this. It would be nice if their recurve seat came in 2 or 3 sizes for differing height riders like Volae carbon seats. (But it’s nice you can mount 2 water bottles on the back of the Euromesh seat & you can’t on the carbon seats). Bacchetta does not allow us to ship their bikes to customers in the US. If you live too far away to come test ride and pick up a Bacchetta bike and cannot find a Bacchetta dealer in your area we could ship a Bacchetta to a bike shop near you for final assembly and adjustment. As always we recommend extensive test riding if possible. We encourage you to support dealers who offer you test rides if there is one in your area. 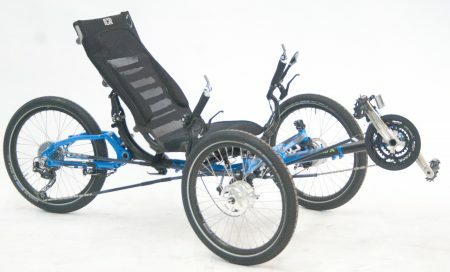 The Bacchetta recumbent bikes are from X-Eyed Design inc. The X-Eyed design/management team includes veteran recumbent professionals with more than 40 years of experience. The people make the company. 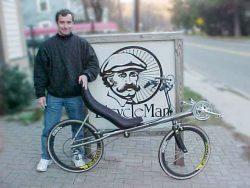 Mark Colliton, X-eyed President, has been riding, designing, building, racing & selling recumbents since the early 1990’s. 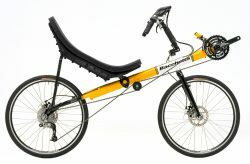 Other recumbent companies have used his designs, including Angletech, RANS and Barcroft. 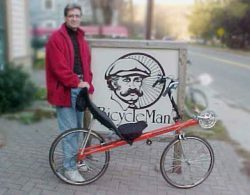 Mark has been a regular contributor to Recumbent Cyclist News, the oldest recumbent bicycle publication in the US. John Schlitter, X-Eyed VP, has over 20 years experience riding, designing and manufacturing recumbents. 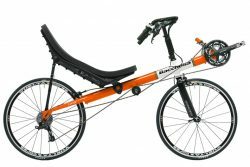 John was instrumental in bringing to market the RANS V-Rex, Gliss, Vivo, Tailwind and Screamer recumbent bicycles. He designed the renowned RANS mesh back seat. 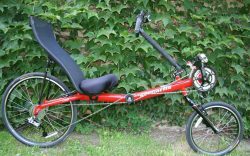 John has owned and operated two bicycle shops over the years, so he knows something about what recumbent customers are looking for. 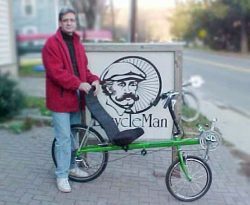 Mark Swanson, an avid recumbent cyclist and X-Eyed experienced entrepreneur. It looks like X-Eyed will be his fifth successful start-up company. 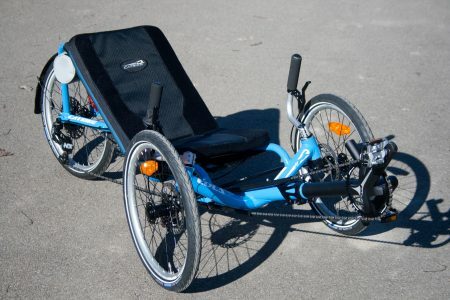 Mike Wilkerson has several years experienced in recumbent manufacturer/dealer relations. He keeps us informed and supplied with all things Bacchetta.